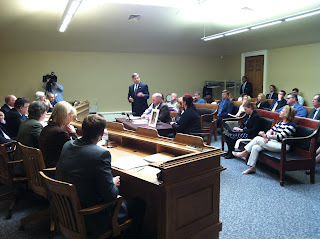 BOSTON – The Legislature’s Joint Committee on Environment, Natural Resources and Agriculture took favorable action today on legislation filed by Senate Minority Leader Bruce Tarr (R-Gloucester) to promote safety at the state’s public beaches through a uniform, color-coded warning and safety flag program. Senate Bill 409, An Act Creating Uniform Beach Warnings, was released from committee with a favorable report this morning following a public hearing that included testimony from Senator Tarr, Representative Ann-Margaret Ferrante (D-Gloucester) and the family of 2-year-old Caleigh Harrison, who went missing on April 19, 2012 while playing with her mother and sister at Rockport’s Long Beach. The effort to pass Senate Bill 409 was initiated by Caleigh’s uncle, David Harrison, who was on a business trip to Panama earlier this year when he learned about the country’s color-coded flag system which is used to warn the public about the dangers of tides and riptides. Alabama, Florida, New Hampshire, New Jersey, Texas and several other states utilize a similar program, and the Harrison family is seeking to implement the same safety measures in Massachusetts.